Have you been faced with a difficult situation? Do you feel as though you have been forsaken, as though you are in the middle of a dry, desert experience in life? These desert experiences are God-appointed seasons when He shows us the wonder of His Holy Spirit, and we realize that even in the desert, God’s gracious streams of supply can be found. 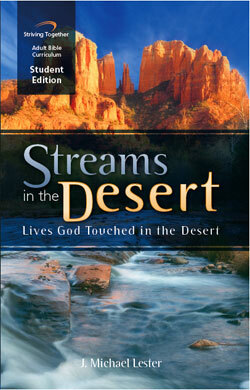 This series of lessons explores the desert experiences of great Bible characters. Each lesson will remind you that God is mightily at work even during times of dryness and difficulty. In every desert experience, God sends streams of refreshment to restore your soul and renew your strength for the journey ahead.